While most pilots typically start in a piston aircraft, they usually dream of flying a turboprop, such as the Pilatus PC-12 NG. 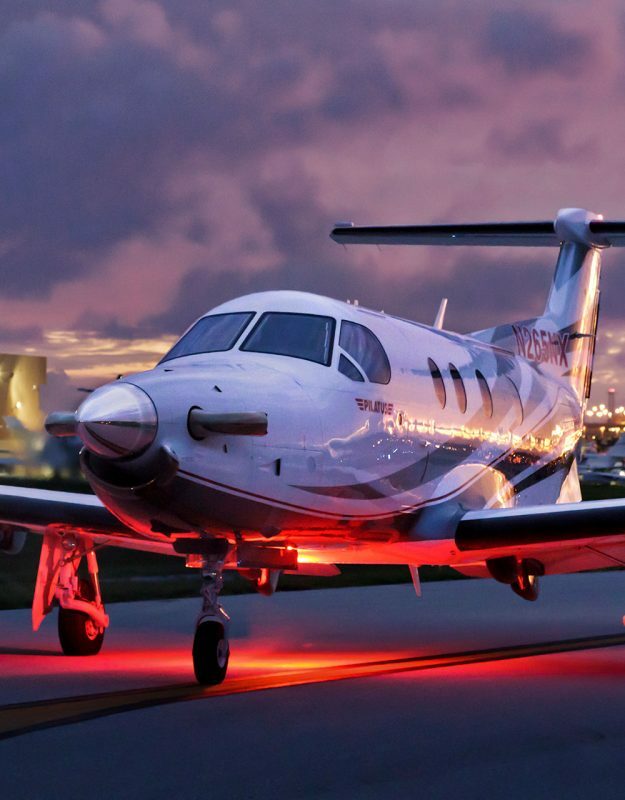 A turboprop offers efficiency and value not often found in a piston aircraft, allowing pilots to take on extended missions and conduct business more effectively. From a safety, performance and versatility standpoint, a turboprop offers a whole new world of flight options. Safety: The ease of usability is greater in a turboprop and it offers more operational control. The aircraft’s reliability also increases. Performance: With a turboprop, your range, speed and payload all increase. In addition, you gain onboard radar and sometimes even anti-icing equipment options that expand your mission capabilities. Versatility: A turboprop allows you to fly different missions than were possible with your piston aircraft. From flying at higher altitudes, in more inclement weather, and flying to a wider variety of airfields, your options increase. The transition from a piston to turboprop may initially seem like a long and arduous journey. After all, more training is needed to ensure your safety while flying with more complex systems than were required in your piston aircraft, and there are more windows for pilot flight decisions. But in the end, the transition is often easier than what people expect. One owner-pilot who has been through the process of transitioning from a piston to turboprop is Joe Ratterman. Joe is the former CEO and chairman of Bats Global Markets and currently flies a Pilatus PC-12 NG. When he entered the world of aviation 10 years ago, he quickly realized private aviation was more than a hobby. It was an improved means of transportation that could enhance his business efficiency and provide him with broader opportunities to travel with family and friends. Tell us a little about yourself. What drew you to private aviation and how long have you been flying? I got into flying about 10 years ago as a passing hobby, not thinking it would turn into anything real. But after flying an ultralight, I decided it would be fun to take my wife and friends up with me. For that, I needed a pilot’s license. So I went about the requirements to get a pilot’s license and towards the end of that process, I realized this was more than a hobby, it was a real means of transportation. Why did you decide to take the next step from piston to turboprop aircraft? I started in a Piper Saratoga II TC. While it was a fine aircraft, it became incredibly obvious that it was not a business class aircraft. It didn’t fly as fast as I wanted, it didn’t have ice capabilities, there was no onboard radar and it had to fly low unless you wanted to wear oxygen. While it was a great plane to fly from Kansas City to Chicago on a sunny weekend, it was impractical to fly the Saratoga to New York and back and still conduct business in between. I tried that flight in the Saratoga once and it was an exhausting seven to 11-hour mission. After that trip, I told my instructor I’d never do that flight again in a piston aircraft. I flew the Saratoga for three months while I got my instrument license, flying 150 hours. Then I stepped up into a Piper Meridian turboprop. I flew the Meridian around 800 hours over the course of three years and it served me well. I could take business trips from Kansas City to Chicago, New York and Washington, D.C. The turboprop also allowed my wife and I to go on vacations we wouldn’t have thought of going on without private aviation. Who did you consult when lining out your transition plan? I consulted with KCAC and their team. I knew that to move into the next airplane, I would have to log a significant number of hours and go through training. What ratings, licenses or certifications did you need to fly the Meridian? To fly the Meridian, I needed my complex and high-performance endorsements, as well as a high-altitude endorsement. Tell us about your transition training. Where did you go? How long did it take? Did it match your expectations? I went to SIMCOM Aviation Training for five to seven days of serious flight training. But before that, I learned to fly the airplane. I knew I wanted to do my SIMCOM training after I knew how to fly the Meridian. So, I worked out a plan with my mentor pilot and for a month we flew as many flights as we could. Then, after putting in 50 hours, I went to SIMCOM, where they use simulator training to teach you how to respond to abnormal flight conditions. You do things repeatedly until you have muscle memory. For me, that’s what training is about. Doing things you couldn’t do in the airplane and gaining that muscle memory. This training was vital and met my expectations. After that, I flew another 10 to 20 hours with a mentor pilot before flying the Meridian solo. What were the biggest differences you noticed, or had to adjust to, when moving from a piston to turboprop? The biggest difference is that everything happens so much faster. The turboprop has a more powerful climb performance than the piston. So all the actions you take during take-off and landing happen faster and you must be careful not to get behind the airplane. That’s why mentors are so important. They can help you anticipate and be prepared for this faster pace. Managing the plane in the air is also very different. In a lot of ways, it is easier to manage a turboprop. For one, you don’t have to worry about shock cooling the turbo charger. In the Saratoga, you would literally have to start planning your throttle 20 minutes before arriving at your airport. If you found yourself late to starting this process and came up on your airport quickly, you could risk destroying your turbocharged engine. But in the turboprop, you pull the throttle back instantly with no concern about how it impacts the engine. The plane slows down in a hurry and puts you on the runway without too much trouble. The icing and onboard live radar features are also game changers. The speed and power of the turboprop is great. But, the ability to fly long distances any time of year is the product of having icing equipment and live radar, along with the altitude capability to get up higher and out of typical weather. I can’t overstate how important and beneficial radar and icing capabilities are for having a business class, highly available, and capable aircraft. What did the transition to a turboprop mean for your business? It meant that I could put myself where I needed to be whenever I needed to be there, without the hassle and stress of doing the same trips on a commercial airline. So I found myself meeting more with clients, regulators and employees. Before, because of the stress of travel, I wouldn’t go as often. The other subtle benefit is that when you are conducting business, you don’t have to be concerned about when a meeting will end. The plane leaves when you leave. So you don’t have to stress about ending a meeting early to get to the airport and check-in for a commercial flight. You just go to the airport when you are done with your meetings. Name one thing that surprised you about the transition process? I didn’t expect just how useful live onboard radar can be for weather navigation. There are so many times when I have used the weather navigation. I use it on every flight. For other pilots looking to transition from a piston aircraft to a turboprop, what advice do you have on making the transition as smooth and painless as possible? I firmly believe there are steps to the process and that there is no reason to rush. You should plan to transition and end up in the left seat when you are ready. Find a qualified and highly available mentor pilot who will fly with you as much as it takes for you to be proficient. Don’t rush the first 50 hours. Take advantage of the knowledge your mentor pilot brings. There will be a lot of things that will happen to you that you have to experience before being ready to fly solo. Training is one thing, but mentoring in the real world is so important. Get that mentoring. I’m pretty pleased with the pace I went through my training and the timing for when I stepped up into each new airplane. Looking back, maybe I would have flown the piston aircraft for another six months at most, just to get more experience on that. But I’ve been cautious about stepping up only when I was ready. I would take the same pace again because the learning was so valuable. When making your decision to upgrade, consult with a team of aviation professionals who can help you put together a concrete plan to make transitioning into your new aircraft as simple as possible. Looking to upgrade soon? Contact us at 913.324.1250. We’ll work with you to put your transition plan in place.